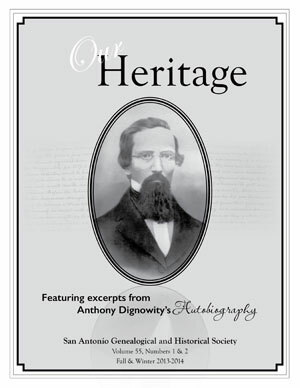 Our Heritage, the journal of the San Antonio Genealogical and Historical Society, is published twice yearly, in January and July. Our Heritage is about and for our members. We are especially pleased that our society is able to champion the abstraction of original records relating to Bexar County, and to offer the opportunity for our members to publish their unique family stories. Articles about Bexar County or material submitted by members in regard to their families of whatever geographical origin are given preference. We need your memories of striking events, your stories of ancestors, your images and memorabilia of loved ones, your research on historical topics, your triumphs in family discoveries! We need you, our members, to photograph, scan, write, polish, and wrap up what you have so we can publish it in Our Heritage! This year we begin our remembrance of World War I. Consider submitting your stories and reports of your research. Identify your ancestors, and reflect on how they spent the war years. Soldiers and nurses deployed overseas, but those men and women on the home front also contributed. Write it down, and share their stories with our readers. Wouldn’t you like to see your family history and research in print? How often do we say “if only we had written down the stories we were told by our grandparents?” How often have we gratefully found a family diary or Bible record in a publication? Now is the time to publish your treasures and to write your stories for your grandchildren and our membership. Something as short as a “memory” can reflect your personality and interests — so hard to decipher from public records. Consider our topics — WWI, the War of 1812, the Blue & the Gray, Memories, the Picture Wall, and featured articles — as ideas for your contributions. Please review our Publication Guidelines and Citation and Stylistic Template before submitting articles. 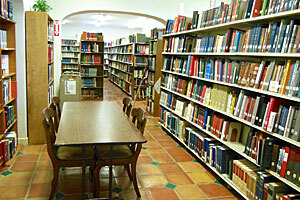 We also welcome reviews of books of genealogical and historical value. An author can request a review or a free advertisement of his/her book by mailing a copy to the attention of the publications committee chairman. Books submitted become the property of SAGHS and will be placed in the library. At the discretion of the publications committee chairman, a free advertisement may be run in place of a review. Material for publication may be emailed directly to the Publications Chair or placed in the Our Heritage box at the Society library.